FINE ESTATE & VINTAGE JEWELRY. 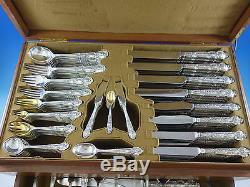 Renaissance by Tiffany & Co Sterling Silver Flatware Set for 12 Service 209 pcs. 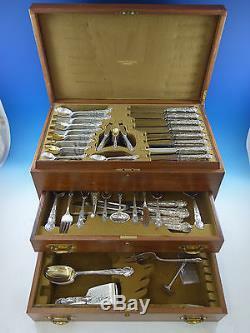 Incredible figural, multi-motif Renaissance by Tiffany & Co. Sterling silver Flatware set, 209 pieces. 12 Banquet Size Knives, 10 1/2. 12 Dinner Size Knives, 10. 12 Dinner Size Forks, 8. 12 Luncheon Forks, 6 7/8. 12 Flat Handle Butter Spreaders, 6. 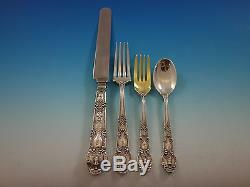 12 Cocktail/Oyster Forks, gold-washed, 6 1/8. 12 Bouillon Soup Spoons, 5 1/2. 12 Demitasse Spoons, gold-washed, 4. 12 Breakfast Knives w/stainless blades, 8 1/4. 12 Fish Knives w/stainless blades, 8 1/2. 12 Gumbo Soup Spoons, 8 1/4. 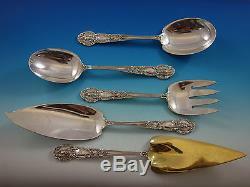 12 Ice Cream Forks, gold-washed, 5 5/8. 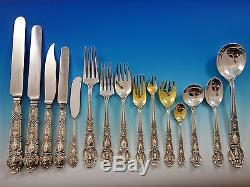 12 Pastry Forks, gold-washed, 6. 1 Gravy Ladle, 7 1/4. 4 Serving Spoons, 8 1/4. 2 Cold Meat Forks, 8 3/4. 1 Sugar Spoon, 5 3/4. 1 Flat Handle Master Butter, 7 1/4. 1 Pickle Fork, 2-tine, 6 1/8. 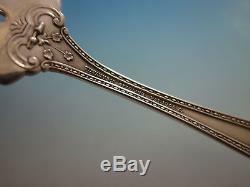 1 Pie Server all-sterling, gold-washed, 10 3/4. 1 Sauce Ladle, 6 1/2. 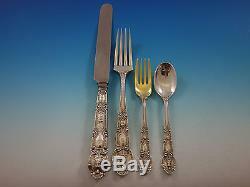 1 Salad Serving Set, all-sterling, gold-washed, 10 1/8. 1 Steak Carving Set, 2-pc, 12 1/2" & 11". 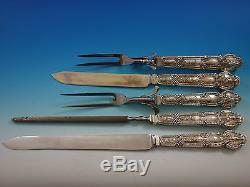 1 Roast Carving Set, 3-pc, 15", 15", & 11 1/2. 1 Asparagus Serving Tong, pierced, 8. 1 Berry Spoon, 9 1/4. 1 Cheese Scoop, 7 1/4. 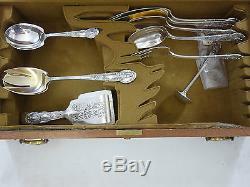 1 Fish Serving Set, all-sterling, 11 3/4. 1 Preserve Spoon, 7 1/4. 1 Preserve Spoon, large, 7 1/2. 1 Sugar Sifter, pierced, 5 3/4. 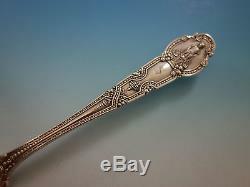 1 Vegetable Serving Spoon, 9 1/2. Includes vintage fitted Tiffany flatware storage chest (some servers do not fit in slots & some open slots in drawers, as shown in photos). 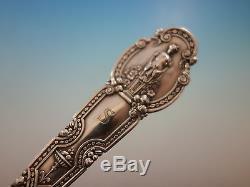 &###xA0; &###xA0; Excellent condition, with matching "S" monogram. Customer service is the foundation of all that we do. We sincerely appreciate the opportunity to earn your business. Personal Service A variety of services is just a moment away. The United States Supreme Court's recent ruling in South Dakota vs. Please check the details in the listing. How do I return my product? This listing is currently undergoing maintenance, we apologise for any inconvenience caused. 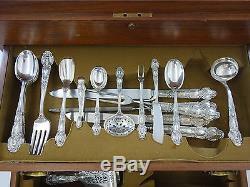 The item "Renaissance by Tiffany & Co Sterling Silver Flatware Set for 12 Service 209 pcs" is in sale since Monday, July 31, 2017.